When I was about 5 years old, I got a stuffed snowman from a yard sale and named it The Abdominal Snowman. I guess I was trying to say Abominable. *sigh* So then Hazel called it The Stomach Snowman. Yeah! Stomach Snowman! Woo hoo! "A dog that inherited $12m (£5.8m) from late New York hotelier Leona Helmsley is in hiding after it was targeted by death threats, US media say. "Trouble, a white Maltese that belonged to the billionaire until her death in August, was flown by private jet to Florida, the New York Post reported." Hilary/Willamina: You always come up with such great stuff! Thanks again. Spring: How's Mr. H doing these days? I miss his crazy comments. Also, did you get the book? I heard about that dog! Stupid lady, if you ask me. Think about all of the terrible things in the world that that money could help-other than a DOG!!! I heard: "This pooch inherited twelve million dollars from his owner: Leona Helmsley. He is now being shipped by private luxury jet to a secret location." JOY! I got my copy of Empress in the mail today! My family and I had a running joke about yetis that lived in Wisconsin once upon a time. I've also heard stories asbout people who leftthair money to their pets. I mean, I love my dogs, but why the heck would I leave them all of my hard-earned cash, though I must admit I do like the idea of putting it in a trust fund for my descendants' education xD. 1. How do you pronounce your name, Ananka? 2. I'm writing a story about a girl who's a ninja. Is it OK with you if I name it "Cute Little Ninja Girl" like the kung-fu movie "Cute Little Demon Girl" in the Shadow City? Hazel: It's ah-NON-ka. And by all means, use the title! Love the girl ninja idea. Oh no! I always thought it was "a-NANK-ah." Oops! Those are...uh...big feet. If that Yeti ever needs a foot massage...triple the price please... I'm also writing a book...books...just 2. But their names are confidential for now. And I've been pronouncing it a-NAN-ka too. How ignorant of me. So will there be a convention? I'm afraid to say that if it was in NYC I probably couldn't go. But wherever it is, (if there is one, I mean) will you take on a tour in the sewer or some other urban exploration thing? That would be too awesome! i have been attempting to write books ever since kindergarten, and so far i have'nt finished one. but i would deffenetly buy cute little ninja girl if hazel publishes it! OK, if I ever get it published, I'll let you know. Don't hold your breath. I just finished the prologue. I thought of pronounced the name Ananka as "uh nahn' kuh" with the uh's being schwa sounds. Do you think that the various bigfoot animals are the same species of animal? That didn't occur to me until just now. 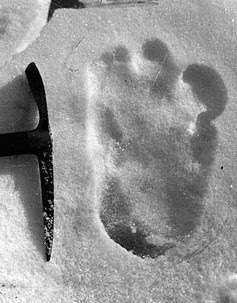 The pictures of the yetis look a lot like the bigfoot pictures I've seen in the past. So do the feet. I pronounced it Ah-NON-ka, but my sister told it was An-ik-ka. (Her friend's sister is named Anika.) I was right!